Nowadays there are so many different situations where you may want to record video footage from your PC screen. It could be that you want to record a Skype chat or online conference so that you can go over it later, or it may even be that you want to create your own video guide. Whatever the case, the one key ingredient that will make that all possible is the software that allows you to capture video from your screen – and that is exactly what the Movavi Screen Capture does. Under the hood of the Movavi Screen Capture, you’ll find pretty much everything that you could possibly need when capturing videos directly off your screen. It will let you define the capture area, set the frame rate, and even pick the audio source that you want to record along with the video. Assuming you want to create video guides then you’ll find its ability to highlight the cursor and capture keyboard actions to be tremendously useful as it will allow your viewers to ‘see’ what actions you’re performing. On top of that, the Movavi Screen Capture also has features to manage the recording, set up a timer, or even take screenshots while the recording is ongoing. While it is definitely comprehensive, what really makes the Movavi Screen Capture unique is that it still manages to somehow be extremely user-friendly in its approach. Every feature that you need will be just a click away, and you’ll find that its interface is both intuitive and accessible. Even if you have no experience recording videos or using screen capture software you’ll definitely find that the Movavi Screen Capture has little or no learning curve to it. Once your recording is done, you’ll be able to save it in a format of your choice or automatically optimize it for any device or platform using the presets that are available. With these presets even if you don’t know a single thing about video formats or settings you’ll be able to pick the device or platform you desire and everything will be set up automatically. 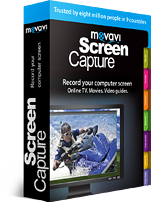 In a nutshell, the Movavi Screen Capture is a screen recorder for Windows that excels at what it does, provides all the features you could require, and yet is easy to use. That should be more than reason enough to certainly give it a go if you want to capture video from your screen.